With the coming of 2018, thoughts are already starting to turn towards the summer and the World Cup, which is set to dominate the footballing landscape of the year. There is a long tradition of the game's greatest competition introducing previously unknown stars to the globe. In 1958, an unknown Brazilian teenager by the name of Pele charmed the watching fans as he made his way to become known as perhaps the greatest player ever, while cult heroes such as Cameroon's Roger Milla and Bulgaria's Yordan Letchkov have been established. The increased visibility of football throughout the world means that there are typically fewer breakout stars at the tournament with each passing competition, yet such is the scale of the game that there are always players who slip through the net. Typically, these stars do not play in any of Europe's biggest leagues, though some younger players may only be known to fans who follow particular divisions. 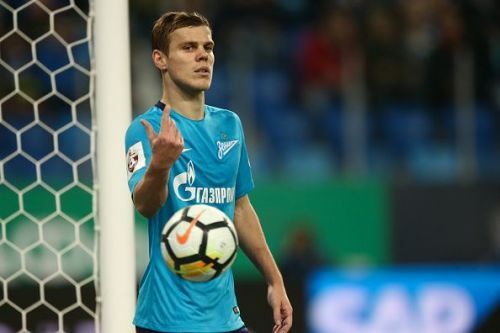 Zenit St Petersburg striker Aleksandr Kokorin will be the man to spearhead hosts Russia’s World Cup challenge. The 26-year-old striker is considered to be one of his country’s best players and is set to have the hopes of a nation pinned on his shoulders. With 12 goals in 48 international matches, his record for the national team is hardly phenomenal, yet he is a player coming towards the peak of his powers. He has been in prolific form with Zenit this season, netting 18 times in 29 outings, including a formidable five in five in the Europa League as the Russians steamed through to set up a knockout meeting with Celtic. Despite this impressive scoring tally, being a finisher is not naturally an intrinsic part of his game. He is the type of forward who buzzes around the penalty box, often in a withdrawn position. He is a player much has been expected of for a long time. He was built up as a wonder kid and two seasons ago, the striker was linked with a move to Arsenal, but the deal never materialised, with the player’s flashy off-field lifestyle perhaps putting Arsene Wenger off. However, there are signs that he has matured and if Russia are to progress past the group stage and deep into the competition, much rests on his shoulders.